The Chieftain Dark Horse is a bagger with a dark side. Now equipped with an open front fender and 19” ten spoke wheel and Ride Command Infotainment system, the industry-leading, seven-inch touchscreen display with GPS. Featuring an integrated 100-watt premium audio system. 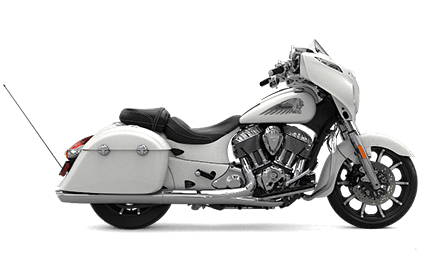 Powered by the Thunder Stroke 111 V-Twin engine and armed with imposing front highway bars. – Pinch. Swipe. Tap. All without removing your gloves. Through this industry-leading seven-inch display, you can get turn-by-turn directions. Quickly find points of interest. Play Bluetooth audio. Check vehicle information and status, plus a whole lot more. – Automotive-quality cruise control is easy to set and adjust for smooth and relaxed highway cruising. – Keyless ignition with the proximity fob in your pocket. – Your cargo is protected inside spacious hard weatherproof sealed saddlebags. You can even lock them remotely with a console-mounted button or with the bike’s key fob. – A nimble chassis, lightweight yet exceptionally strong, with an outstanding steering geometry, provides excellent low-speed handling and confidence-inspiring stability on highways as well as on twisty and tight curvy roads. Housed in this frame is the unmatched performance of the Thunder Stroke 111 V-Twin engine. – With ABS brakes you’ll ride with confidence knowing you can brake in any situation. – Built into the fairing is a 100-watt audio system producing premium-quality sound from dual high output speakers. Smartphones and other audio sources can be connected via USB or Bluetooth. – With this well designed large backrest passenger pillion we have your companion’s riding comfort secure. The strong luggage rack will give you more space for extra cargo.